Oh god, I have 10 hours of classes today. 10 hours?! Dear Lord! You have my sympathies! I love how the bubble stems go behind the partition thing to show that someone behind it is talking. That’s clever. Not so much clever, it was the only way that made sense XD But thanks! WHICH MEAN PHE IS FINALLY HERE!!!! HOORAY!!!!!!!!!!!! Yes, next page XD Yayyy! Oh my goodness, it’s finally happening. I love this chapter. More than that, I love the distinctly different tone that you’ve already established! Goodbye greens and fluid curves, hello reds and formal angles! is there a signifiant reason why his fingers are sorta dark or is that shading? and it is weird that the vote incentive is the most adorable thing i have EVER SEEN? Yeah, his fingers are somewhat messed up. They were broken a while ago so he still has some circulation issues with them. wow deady fingers no front teeth and one leg, what has this guy been doing!? I love how you put so much thought into everything. Sweet! The color change in the hand is mysterious and forboding, and I really love the raking light across the tendons in that frame, it’s one of the most excellent man hands I have ever seen. Also, good job contrasting the hands against each other in the last frame in case we missed it. HUUUUGE contrast in color between the adventures of Angora and now, my eyes had to readjust XD. Love the colors by the way. I couldn’t say anything to the chapter cover ’cause I was so overwhelmed D: Srsly. I really like how you did the page, builds up a lot of suspense for me! I have little crush on Luca. And I want his furry boots! That shading on his hand & arm in panel three? LOVE. It’s wonderful that you’ve defined real-world musculature by shading on a cartoon-y character. YES! I’m so excited for this chapter! :D to the thousandth degree, seriously. I love the fact that he has no front teeth. I’ve never actually seen that on a character design before! Lucaaaaa! And Phe! I feel like a crazy fan girl I am so excited! I just want to say that I am so amazed by your line-art time and time again. You somehow manage to keep it so fluid all the time. Great job. Crap, ten hours, I wish you luck. XD Remember, no spoilers in the comments! ^_^ Man it’s so great to see Luca, gah~ This is such a color change, I absolutely love it. Your choice in color palates is amazing. The wordless panel before “I like peace!” is a great touch. Yay paciiinnngg! Beautiful page, the colours are lovely. <3 I really like this. The colors, the poses, everything. So natural. I’m interested in seeing how much this will deviate from the original sketch comic. I’m excited! Such new wonders to behold! Oh my how on earth are you doing these textures?? The carpet on the previous page, the wall paper, the cushion Luca is sitting on, even your wood screen there looks very cool. This is a serious question, by the way. Is that a boot or a prosthetic leg? I forgot to comment before, but the cover was jaw droppingly awesome. This page is no different. I love the details like Luca’s fingers being darker due to poor circulation and the pause in the panels with the “I like peace!” The first panel’s dialogue balloon coming from behind the screen is great too, as well as the pattern detail on it. All around awesome stuff. Good luck with crazy 10 hours of classes! Thank you very much for noticing all of that XD Sometimes I wonder that all the details are for nothing, then you guys make me feel bad for underestimating your eyes, haha. I do hope we get to hear the story of how he lost those teeth and the leg. I’ve had several family members go through the losing-body-parts-to-disease phase, and your depiction is spot-on. Brr. This is the first time I comment here! I’m glad Chapter 2 is already out, and I have no words for the cover… o_o Awesome! Awesome opening page, you get an idea of their relation from the very first second. how come everyone knows who the people are?? How do we know his name is Luca? The author of this comic already finished the Sketch version, and it used to posted on his Live Journal (I think…). Most of his current readers already read the entire sketch version. I dunno how far she’s done the sketch comic up to (because I’m trying not to spoil the story for myself) but I know she’s done quite a bit, and actually if you looked in the cast section you could find some of the character’s names/stuff about them. I only know most of it from deviantart. I’m…giddy? Yes, giddy. I think I’m giddy. I just can’t wait for EVERYONE TO BE REVEALED AS SPACE ALIENS AND THEN DANCE. Just like in the sketchcomic. Oh, no spoilers on the comments? Sorry! Lovely first page of the new chapter. :) Love the shading in particular! I love how his eyes are never visible. Your shadow effects have rendered me speechless. That must have taken a long time to get right, but the end result is exquisite. 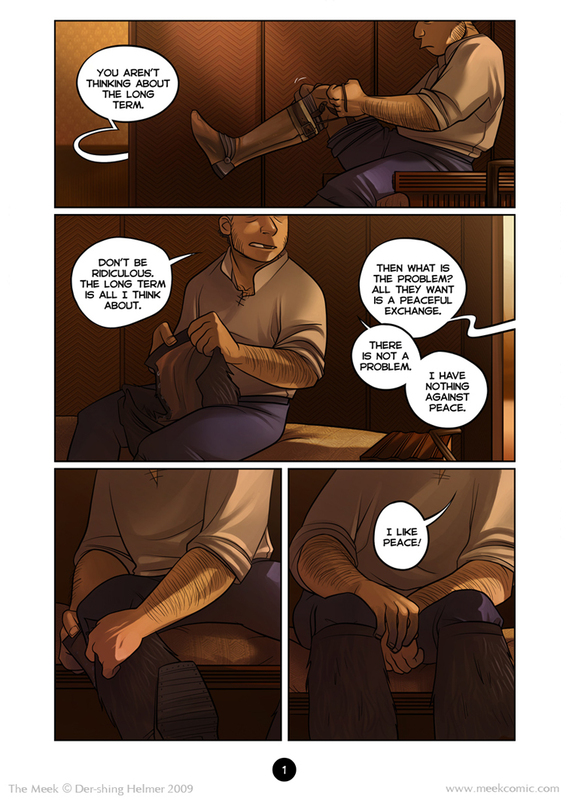 I had no idea what people were talking about with Luca’s fingers; is it the redness you see on the last two panels, or just the shading in general? I thought it was just shading 8D; My desktop comp displays colors darkly, so if I were on my laptop I might be able to see that better. FU, desktop computer. I love this comic so much. And I kind of want his boots, even though I’m pretty sure I can’t pull that sort of look off. When I saw a hole on the banner hanging from the wall in the cover I thought about retired general of some sort, but the guy seems more important than that. Ten hours of classes!!! I hope the kids were quiet and well behaved (like that’s even possible). And half of the kids were! The other class though… yikes. Haha, I guess I work more than 10 hrs a day if I count in the time I do comics… but it seems unfair to classify that along with stuff like having to wrangle a classroom or sit in lecture for hours. ah either it’s brighter now or it’s my computer changing colors. I like it brighter because you can see more of what’s going on, but i must admit that the really dark reds and browns gave an awesome mood. This seems to me like a line which I’d expect to see in terrible writing. It’s definitely a great line here, but I can’t stop imagining overly cheesy perfect hero-types saying it. Great thing he’s not a ((this comment has been censored by the Upright Angora Brigade)). ^_^ And that’s all I have to say about that. it seems you colouring got kind of better nice job ;)!! Hi! I followed through a link at Kukuburi and LOOKWHATIFIND. More awesome webcomic adventures to follow! Beautiful work and great story so far, I can’t wait to see how things develop! Can´t wait to see the next pages! I love The Meek! The art is beautiful, the chars are engaging and what I’ve seen of the plot and the setting seem complex and fascinating! Good luck at school. This comic is beautiful! I love everything about it. Sooo glad I just stumbled across it one day. Keep up the amazing work! I know you will! I love The Meek, it’s really really awesome :D I read it on deviantART and now I can’t wait to read it here! Your drawing style and colouring is great. By the way my name on devART is ~fallen-dream99. Does he have a prosthetic leg? Or is it just a really cool looking boot? Its a prosthetic! Luca is a BK (below knee) amputee from an incident when he was in his 20’s. Cool! My friend Paul is too! i’ve never seen a better comic in my life (when’s it gonna hit the shelves i’ll buy that).